Most of the perch recipes that I enjoy cooking comes by way of pan frying them. However, they can be baked just as well if you'd prefer going that route. Using whole perch is great for obtaining most of it's natural fresh flavors, but I also absolutely love how delicious and mouth watering the fillets taste cooked on their own. For those of you that are new to understanding or eating this fish, perch is a mild flavored tasting fish with a low to moderate fat content. So, wherever you go for perch - whether it's freshwater fishing at your favorite lake, or snagging them from the ocean, including sitting on your little perch on the freezing cold ice, or buying them from the fish monger - I don't see how you could miss by conjuring up one of these pleasant recipes. The following are a couple of our favorite recipes for perch. Enjoy! Preheat oven to 500°F. Heat up a cast iron skillet with a heat proof handle thoroughly to a medium high heat. Meanwhile, score the skin of the perch fillets with a sharp knife. Turn the fillets skin side down and season the top side with salt and pepper. 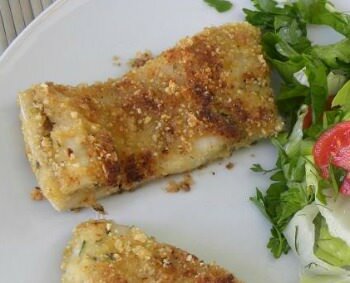 Combine the herbs and bread crumbs together and spread onto the fish fillets, patting gently to help it stick. Coat the pan with about 1/16" of olive oil and allow it to heat up. Carefully add the fillets skin side down to the pan and place in the oven. Cook for about 6 to 8 minutes or until done. Lightly season the perch fillets with salt and pepper. Coat them in the flour and shake off the excess. Heat up 2 tablespoons of olive oil in a large frying pan over medium heat. Add the fillets and cook on both sides for about 4 minutes per side until lightly golden brown. Remove to serving plates and keep warm. Tip: When pan frying perch fillets, leaving the skin on seems to work best for many occasions, and the skin gets nice and crispy which provides some depth to all of the textures in the fish. Remove any burnt tid bits from the pan. Add the lemon juice, garlic and herbs, and cook until it has reduced down to nearly dry. Remove the pan from the heat source and stir in the butter until thoroughly melted. Season with salt and a generous pinch of pepper. 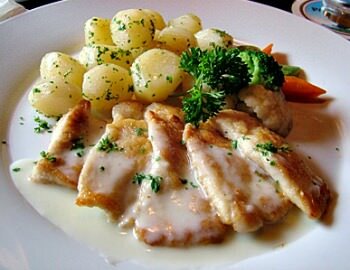 Pour the sauce over the perch fillets and serve. See more of our other fresh varieties of buttery fish sauce recipes like the one we just used in this fresh water fish recipe.